Yes, there certainly is a wonderful holiday that falls between Halloween and Christmas! And, while I admit I make fewer Thanksgiving cards than I do for other holidays, I do like to create some lovely fall and Thanksgiving cards during this season. I created this one using some of the brand new Peel & Stick holiday mix stamps from PSA Essentials! I love this gorgeous pumpkin stamp! It's just a wonderful size and perfectly plump! I do so love a perfectly pump pumpkin! You can check out LOTS of amazingly cool ideas over on the PSA Stamp Camp blog! Not just cards, either, here, folks! I'm talking LOTS of great ideas!!! love that lil pumpkin:) TGIF! 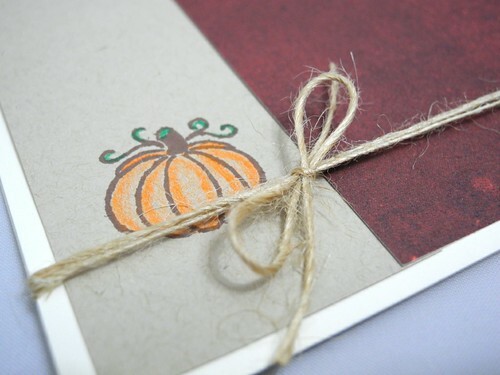 I love the two colors and just one simple little pumpkin ^_^ A card anyone would be happy to receive!! Your card is so pretty! I love the simple design. What a super sweet card! LOVE your pumpkin! Super cute! Love that teeny stamped pumpkin! Cute! I like that pumpkin stamp too. Where does the time go. I so need to make a few Thanksgiving cards. keep it simple great idea! love the pumpkin stamps~ super cute card!!! !